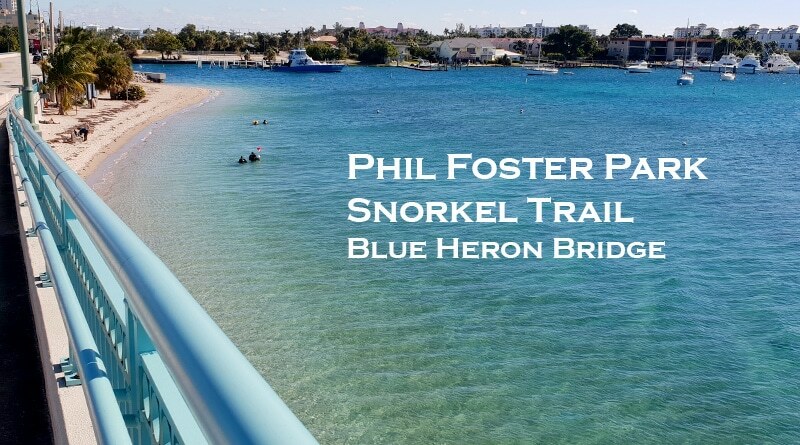 The Blue Heron Bridge snorkeling trail is one of the best place in West Palm Beach to take your family and friends for an underwater journey. Visit to the Phil Foster Park and explore Florida’s marine life! 1 Blue Heron Bridge snorkeling trail – how to get there? Blue Heron Bridge snorkeling trail – how to get there? The Blue Heron Bridge in Palm Beach Country connects Signer Island to Florida mainland. On the small island under the bridge in the Lake Worth Lagoon there is a 15 acre beach park, the Phil Foster Park with life guarded beach, fishing area and playground. 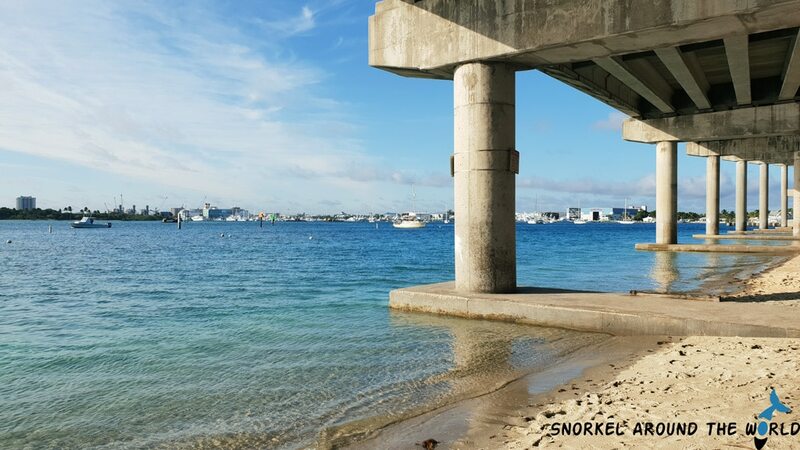 Some years ago, a snorkel trail (commonly known as Blue Heron Bridge snorkeling trail or Phil Foster snorkel trail) was added to the park in order to make it attractive for divers and snorkelers by inviting sea creatures to the area. With clear water and rich marine life, the beach park is a nice place to dive and became one of the best snorkel places in Florida. 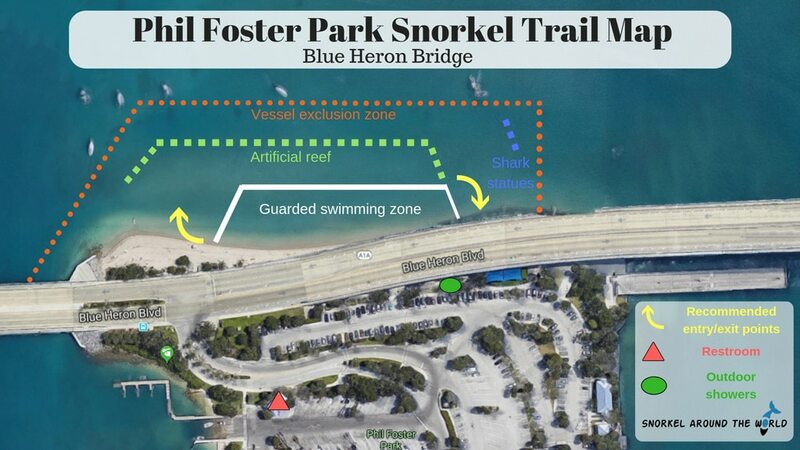 To get to the Phil Foster snorkel trail, take the Blue Heron Blvd towards Singer Island and turn left at the park sign! Free parking is available as well as restrooms and outdoor showers. Also, there is supermarket within walking distance. Tip: if you are around, don’t miss out visiting the nearby Peanut Island Park snorkeling lagoon! The Blue Heron Bridge snorkeling trail is about 800 ft long and runs about 200 ft offshore. 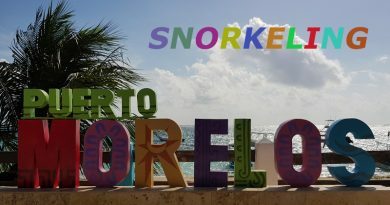 With easy access from a sandy beach and an average depth of 6-10 feet, it is a perfect place for shore snorkeling as well as shallow water diving. The trail mimics a barrier reef including 6 concrete modules, 15 larger and several smaller rock piles along the shore. The small rocks provide shelter to tiny marine animals while as corals started to grow on the blocks, many different fish species settle down here. 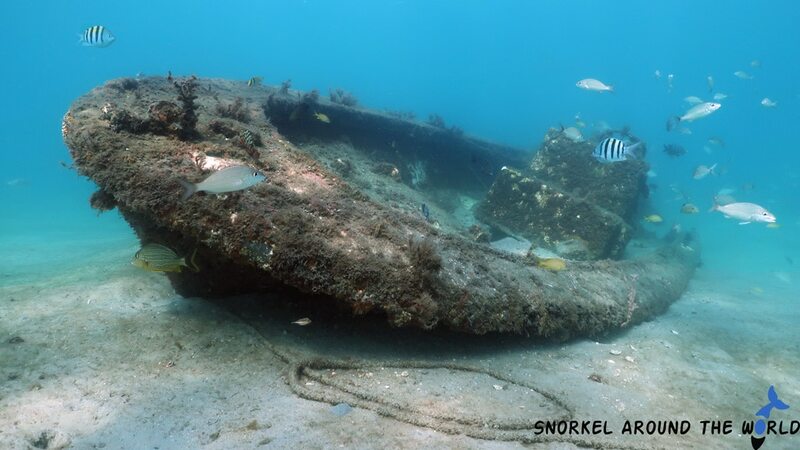 Besides the artificial reef installation, you will also find other structures like a small shipwreck, shopping carts and even 3 hammerhead shark statues! The shark sculptures were donated to the Phil Foster snorkel trail by Tom McDonald artist in 2015. You can see the location of the underwater objects as well as the recommended entry and exit points on the Blue Heron Bridge snorkeling map below! The Phil Foster Park, like other Florida State Parks, is a well-maintained area that offers everything you need for a relaxing beach day. If you decide to take your family for a Blue Heron Bridge snorkeling tour, pack usual beach essentials. 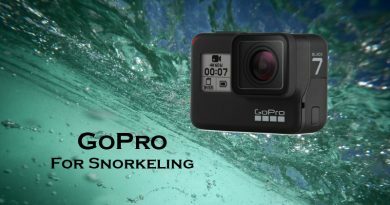 The nearby dive shop and Jupiter Outdoor Center offer gear and kayak rental as well as provides tanks for divers, but if you have, bring your own equipment for snorkeling! The diving/snorkeling area is protected with buoys where boats cannot enter. However, for your own safety, always carry a surface marker/dive flag! 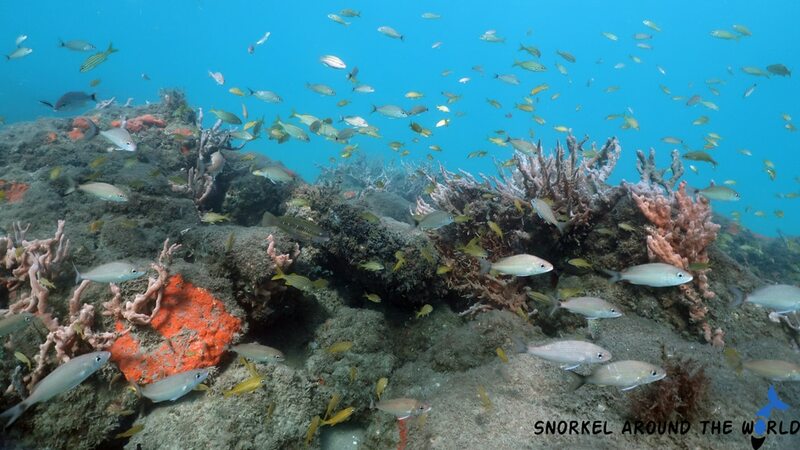 Although the Blue Heron Bridge snorkeling trail doesn’t offer such vibrant reefs that you can see for example on a John Pennekamp snorkel tour in Key Largo, but there is a lot more to see here than you might think! 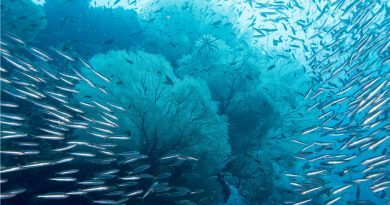 Thanks to its geographical location, the Phil Foster Park became a resting place and breeding area for many marine species. The biodiversity is amazing; more than 300 species have been observed here from the giant Florida manatees to tiny worms and nudibranch. If you are a keen observer, you might spot sea stars, seahorse, octopus, crabs, shrimps and lobster too. If all these wouldn’t be enough, stingrays, eagle rays and sometimes turtles also visit the trail! Snorkeling at Phil Foster Park is possible all year round if the weather allows water activities. In summer, wear UV protection rash guard to avoid sunburn and accidentally jellyfish stings, while in winter, the best is to use a neoprene suit for snorkeling that keeps you warm. The Blue Heron Bridge snorkel trail is a strictly high-tide spot! The incoming tide brings in fresh, clear ocean water making the visibility excellent and the reef lively. 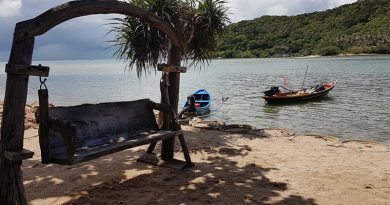 At low tide, due to limited visibility and strong currents water activities can be dangerous, therefore not recommended. The best time for diving and snorkeling starts 1 hour before high tide and ends 1 hour after it. Before your visit, make sure to check the Blue Heron Bridge tide table so you can arrive just in the right time! Tip: weekends are very busy in Phil Foster! Schedule your visit for a weekday if you can!